NEW YORK — What do Kenneth Copeland, Paula White, Jan Crouch, Dr. David Jeremiah and Robert Jeffress all have in common? A video has surfaced online showing the men and women, along with others, laying hands on Republican presidential candidate Donald Trump this week and praying for his potential presidency. According to reports, an estimated three dozen spiritual leaders from across America met with Trump for over two hours at his Trump Towers on Monday, providing advice. Those in attendance included a number of nationally-recognized televangelists and prosperity preachers, including the aforementioned Copeland, Crouch and White, as well as TBN regulars Jentezen Franklin, Steve Munsey and Clarence McClendon. 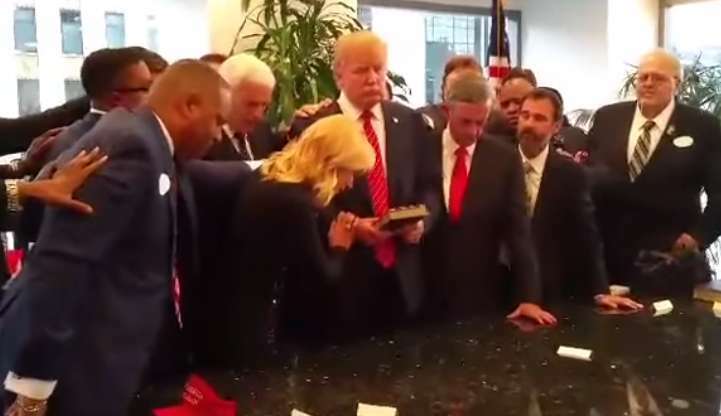 The meeting concluded as many of those gathered laid hands on Trump and prayed for God’s wisdom and favor on the candidate—the last few moments of which was captured on camera. He was flanked by White on one side and Jeffress on the other. Kenneth Copeland, who leads Kenneth Copeland Ministries in Texas and has come under criticism for his health and wealth teaching, asked for wisdom for the candidate. Following Copeland, Kirt Schneider of Jews for Jesus laid his hand on Trump’s forehead and prayed the Aaronic blessing over the Republican presidential candidate. “Donald Trump, the Lord bless you and keep you. The Lord make his face shine on you and be gracious to you. The Lord lift you up with His countenance and give you His peace,” he declared. But not everyone is happy to hear about the meeting. Russell Moore, the president of the Ethics and Religious Liberty Commission of the Southern Baptist Convention, said that he was concerned that out of all of Christianity, billionaire Trump seems to be attracted to prosperity preachers. “The people that Trump has so far identified as his evangelical outreach are mostly prosperity gospel types, which are considered by mainstream evangelicals to be heretics,” he told Politico.